This quick video shows you how to properly set-up and operate your Apollo 12 Titan Controller. 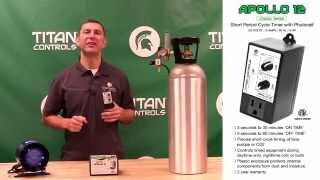 Watch as Mike Gardner highlights the features of the Apollo 12 Short Cycle Timer from Titan Controls. What is the maximum operating temperature for the Apollo 12? The maximum operating temperature for the Apollo 12 is 122°F. Operating the Apollo 12 in temperatures higher then 122° F will significantly reduce the lifespan of the device being plugged into the Apollo 12.